Single microtubules consist of tubulin dimers strung in what are called protofilaments, usually thirteen parallel protofilaments arranged to form an openwork cylinder. An axoneme has two such singlet microtubules in the center, ringed by nine doublet microtubules, which are basically two singlets attached along their length. The whole coaxial bundle is linked together and activated by other proteins. "Given that we had a large supply of axonemes in the form of sperm from local sea urchins, it was a logical extension of the microtubule singlet work previously done in this lab to study microtubule doublets," says Sui. 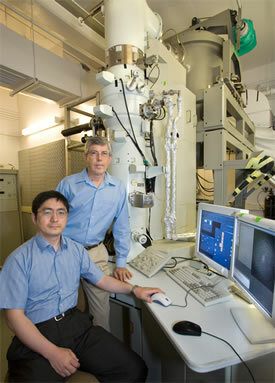 The Downing laboratory has been a pioneer in the use of cryo-electron crystallography, in which protein structures are reconstructed in silico using data from many images and diffraction patterns of tiny crystals of the protein. They also use single-particle methods, in which structures are visualized using images of hundreds of "particles," individual proteins frozen in random orientations on a flat surface. Says Downing, "Haixin persuaded me that we could use our new electron microscope to do high-resolution cryo-electron tomography on these structures." Cryo-electron tomography goes a step farther than single-particle reconstruction, starting with one or a few high-quality samples (typically complex protein structures) and tilting these under the microscope's electron beam to obtain the data for computer reconstruction of a three-dimensional image. The computer can also combine, or "dock," models constructed using several different methods, to achieve higher resolution in some parts of a structure and to provide clues to the identity of unknown structures. Sui first prepared the sea urchin doublets for electron tomography by separating the axonemes from the sperm heads and using solutions of salts and sugars to remove the axoneme membrane. The process also removed many associated proteins whose identity was already known, including the molecular motors kinesin and dynein. But along with the skeletal microtubules, other key proteins remained. Using the tomographs, the researchers were able to pinpoint the spacing and arrangement of the overlapping microtubules that form the doublet. Viewed in cross section from the top, both are slightly squeezed. One of the two, the A tubule, corresponds to a complete singlet having 13 protofilaments; the other, the B tubule, would measure 15 protofilaments around if it were complete, but five of these are lacking where the two tubules are joined at the partition. The partition between the tubules is formed by four protofilaments of tubule A, three of which form a stable ribbon, a sort of backbone for the doublet. At one end of the partition there's an opening between the tubules  here, researchers working from lower-resolution micrographs had long assumed another protofilament must lie. Using cryo-electron tomography from micrographs of axoneme doublets like the one at upper left, researchers derived a model of the doublet that revealed protein structures linking the composite microtubules (1 through 13 in the A tubule, 1 through 10 in the B tubule) in unexpected ways. "We showed there is no protofilament there," Downing says. "Instead, there's a linker protein that crosses the gap between the tubules. We also have hard evidence for the identity of some of the inner binding proteins," which are concentrated along the sides of the inner partition. These binding proteins add stiffness to the partition, which causes the two tubules to appear squeezed or flattened, profoundly limiting the way the doublet can bend. 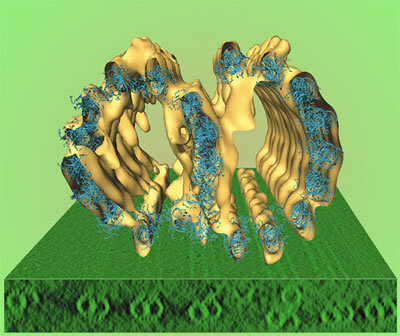 The cryo-electron tomogram yields a three-dimensional model of the doublet that can be rotated and viewed from any angle; seen from the side, the partition shows protein structures repeating in multiples of eight nanometers, the length of the tubulin dimers that make up the protofilaments. Some processes bridge from the backbone ribbon to protofilaments on either side; the shorter ones repeat every eight nanometers (corresponding to a tubulin dimer) and the longer ones repeat every 16 nanometers (two dimers). There are several other protein groups inside the wall of the A tubule. 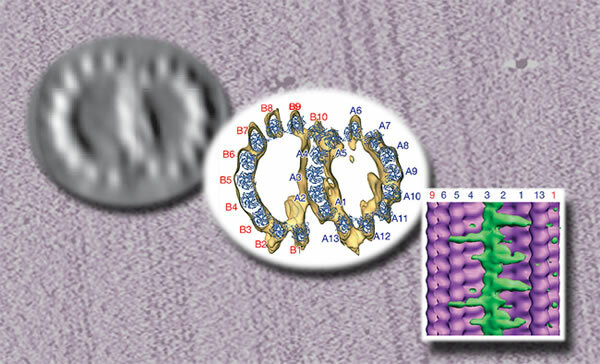 Evidence from transmission electron microscopy suggests that some of the proteins inside the A tubules are various forms of tektin. Biochemical evidence and immuno­fluorescence microscopy indicate that the linkers, which extend outward from the partition to close the gap between tubules A and B (and also repeat at 16-nanometer intervals), are probably made up of a pair of polypeptides, known in sea urchins as Sp77 and Sp83. "This is the clearest anyone has ever seen inside the doublet," says Downing, "and it gives us fundamental structural information, answering a number of questions about axonemes. Side by side doublets slide up and down relative to each other, but A and B tubules within the doublets do not slide against each other, as some have proposed. The stiffness of the tubules determines the plane in which the doublet can bend, and the linker protein across the gap between the tubules allows even an individual doublet to twist. 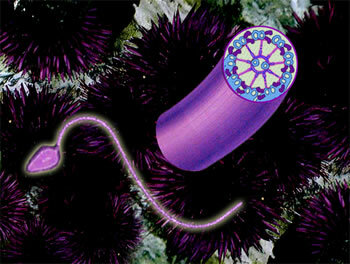 Because of their arrangement in the axoneme, the axoneme as a whole twists under stress." These first results with cryo-electron tomography open many paths to knowledge about the vital axoneme structure. "We already have hints about the structure of linkages between the doublets in the axoneme," says Sui, "which may give us information about the coordinated sliding of the doublets." "Molecular architecture of axonemal microtubule doublets revealed by cryo-electron tomography," by Haixin Sui and Kenneth H. Downing, appeared May 31, 2006 in Nature online.